From an impressive sisterhood of YA writers comes an edge-of-your-seat anthology of historical fiction and fantasy featuring a diverse array of daring heroines. Crisscross America -- on dogsleds and ships, stagecoaches and trains -- from pirate ships off the coast of the Carolinas to the peace, love, and protests of 1960s Chicago. Join fifteen of today's most talented writers of young adult literature on a thrill ride through history with American girls charting their own course. They are monsters and mediums, bodyguards and barkeeps, screenwriters and schoolteachers, heiresses and hobos. They're making their own way in often-hostile lands, using every weapon in their arsenals, facing down murderers and marriage proposals. And they all have a story to tell. Brassy bank robbers, brave trailblazers, and ball-busting débutantes make all sorts of noise in this collection of 15 stories...Each individual story is thoroughly researched, and each includes an author's note explaining the context. The heroines are tough and memorable and full of heart, and the concept is irresistible. Stock up--this one will practically sell itself. 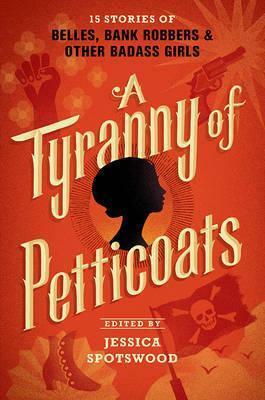 --Booklist (starred review) Fifteen notable YA authors come together to write enthralling short historical narratives starring ambitious young women...Each entry is strong on its own, and the characters' voices are unique in each tale. Teens will be hard-pressed to choose a favorite, and even those who are not fans of historical fiction might find a genre-blended tale worth reading. Overall, the pacing for each selection is steady, and the conclusions have enough punch to make the characters and their situations memorable. A must-buy. This collection will be sure to spark an interest in anyone who wants to indulge in strong and introspective young women living in a variety of historical time periods. --School Library Journal (starred review) These energizing, adventurous, and occasionally somber tales will readily please fans of historical fiction. --Publishers Weekly There is range and balance in tone, voice, and approach, a challenge for anthologies. Placing the stories in historical order allows readers to move smoothly through, and a helpful author's note follows each selection. Readers of historical fiction and adventure need look no further. --Kirkus Reviews Fifteen short stories by notable YA female writers move across the U.S. in geography and time, from a seafaring adventure in 1710 to the search for gold in Alaska in 1898 to the civil rights movements of the 1960s...this anthology moves skillfully between humor and thoughtfulness as it traverses the many paths taken by women throughout American history. --Bulletin of the Center for Children's Books "A Tyranny of Petticoats" provides adventure and entrée to other times and worlds. This anthology doesn't just spotlight the experience of white girls--it also emphasizes the roles of girls and women of color. --Star Tribune These are adventurous, historical, tough, and memorable heroes...and they are all female. This title would be a great historical fiction addition to school libraries with its strong plotlines and strong female characters. --School Library Connection Overall this collection serves not just to entertain and educate young adults. It also seeks to place their own experiences on a spectrum of teen contributions to history. And, at its best, "A Tyranny of Petticoats" motivates young readers to pick up where these characters left off and to keep living -- and creating -- their own stories. --Pittsburgh Post-Gazette No two stories are alike. No two characters either. No two settings for that matter, as these stories crisscross the continent. But if you're looking for role models for young women, you're bound to find something here to like.